Traditional Chinese steamed pork bun recipe (char siu bao). Each soft and tender bun is filled with sweet and savory barbecue pork. You don’t have to leave home for some dim sum! Chinese new year is just around the corner! This year on February 10 we celebrate the year of the Snake, the sixth animal in the Chinese zodiac. The snake is known for being keen, cunning, intelligent and wise. The Chinese lunar calendar is based on a 12-year cycle represented by different animals (except the majestic dragon) and their characteristic attributes. To celebrate the new year, I thought it would be fun and festive to make a classic steamed pork bun recipe, also called char siu bao. The filling is made up of tender pieces of pork marinated in various Chinese spices and sauces giving tons of flavor in each bite. You can take a look at my Cantonese char siu recipe to see how I made the pork. To shape the bun, each piece of dough is gently hand rolled to create a round surface, 1 tablespoon of pork filling is placed in the center, and then the bun dough is carefully pleated until the filling is encased in the dough. The buns are covered and allowed to rise for about 30 minutes to yield a lighter and more tender bun after steaming. The steamed pork buns are cooked for 8 to 10 minutes in the steamer, and expand almost double in size! Once uncovered, the buns are piping hot and extremely tender and soft, making it hard to eat only one! The steamed pork buns reheat very well too. I have some in my freezer for any time I get a craving! The pork in this steamed bun recipe can be substituted for any of your favorite fillings, in one of my other favorite recipes I made steamed custard buns, also known as Nai wong bao. This is my go-to steamed bun recipe, it has worked perfectly every time I’ve made the buns, and I promise that your friends and family will be very impressed! You can learn how to make the basic steamed bun recipe and how to shape the buns in the video below. TIP #1 – The buns are made from a yeast-raised dough, the yeast acting as the leavening agent. The magic that happens to help make the dough rise is fermentation. Yeast are living organisms, so just like us, they need food to grow. During fermentation, the yeast eats the sugars in the dough, and the result (by-product) is the creation of alcohol and carbon dioxide. The alcohol evaporates during baking, and the carbon dioxide assists in leavening. TIP #2 – The absolute most important step in making yeast-raised dough is not to kill the yeast. It is one of the first steps in the process and the most integral. Yeast die at temperatures above 138°F! TIP #3 – Temperatures between 100 to 110°F is optimal for hydrating active dry yeast. In the recipe, I indicate to combine warm water at 105°F with sugar and yeast. When the yeast mixture is allowed to sit for 10 minutes, you can see fermentation in action! The mixture starts to foam from the yeast eating the sugar and creating carbon dioxide. If you do not see any foam created, your yeast has died. Start over and make sure to use a digital thermometer to test the temperature before you add the yeast to the water. Traditional Chinese steamed pork bun recipe (char siu bao). 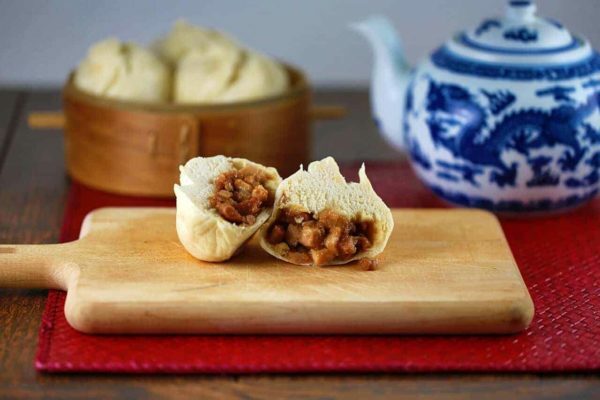 Each soft and tender bun is filled with sweet and savory barbecue pork. You don't have to leave home for some dim sum! For the filling base heat the oil over medium heat and sauté the shallots 2 minutes or until light brown. Add the flour, stir to combine, and cook 1 minute. Add the chicken stock, stir well, and cook 2 minutes. Add soy sauce and cook one minute. Remove from heat and stir in cut pork and seasoning ingredients (oyster sauce, sugar, peanut oil, and sesame oil). Chill until very firm. Dissolve sugar in warm water, sprinkle yeast over; let stand 2-3 minutes, and then stir to mix well. Let set until it starts to foam, 10 minutes. Sift flour and make well in the center. Whisk together the lard/ shortening, sugar, yeast mixture, and milk. The fat will not completely dissolve into the liquid. Combine liquid mixture with the flour; gradually incorporate the flour with the liquid to make the dough. Punch dough down and flatten out to about ¾ inch thick. Spread the baking powder mixture evenly on the dough (this acts as a stabilizer). Roll dough up and knead about 10 minutes, or until smooth and satiny. The dough should be firmer than regular white bread dough. Divide the dough into four equal parts. Roll one piece by hand to form a rope approximately 9 inches long and 1¼ inch in diameter. Using a rolling pin, roll each into a round disk, making a quarter turn with each roll. Place about 1 tablespoon of filling at the center of each dough round, flat side up. Steam on high heat for 8 to 10 minutes. Do not uncover the steamer any time during the steaming. If a flat lid steamer is used, wrap the lid in a kitchen towel to prevent condensed steam from dripping on the buns. These bbq pork buns look so good! I love them, but never try to make them. This recipe would be a great start for me. Thanks for sharing. @Lokness- Let me know if you have any questions, I would love to help! at what point can you freeze the buns? after forming them, after letting them rest? thanks for a great recipe! Hi Irene! I freeze the bun actually after I steam them and allow them to cool. Then you can either re-steam them or pop them in the microwave for a few seconds when you are ready to eat! Have you ever frozen them before cooking them? 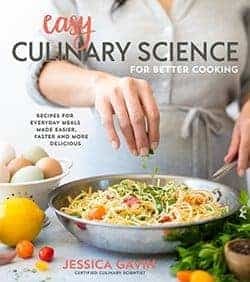 Thank you for this recipe Jessica. I noticed that the filling you used looks different (wet) from your char siu pork recipe. Did you add any additional ingredients? Hi Kristan! Yes, check out the ingredients section in the recipe, the “seasoning” and “filling base” lists the ingredients I used to combine with the diced pork for the buns. Essentially a mixture of oyster sauce, sugar, soy sauce, shallots, flour and chicken stock. Please let me know if you have any other questions! Hello Jessica Thanks for the nice recipe. I made this today with chicken instead of pork (hubby doesn’t really like pork) and it was phenomenal. I believe all the time and effort that I put into it was all worth the delicious bao waiting to be consumed. I followed your recipe to a t, except that I made this to 16 bigger ones and ended up with thicker dough on top. Anyway it was still enjoyed, very yummy i should say. The video was such a big help. Thank you. Hi Kiki! It’s so great to hear that the recipe was a success! Your feedback makes me so happy and encouraged to continue to share recipes. I’m glad that the you tube video also helped! Happy cooking! I really want to try this but i dont have lard.What’s the substitute for lard? Hi Karla! Yes you can substitute shortening (like Crisco) or butter (softened to room temperature). Hi, Jessica…You said that we can substitute shortening to butter? How many spoon butter that we have to put in dough? Hi Ling! You can substitute the butter 1:1 for the lard or shortening (add 2 tablespoons of butter). 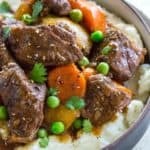 Hi, Recipe looks like the real thing and I can’t wait to try it. 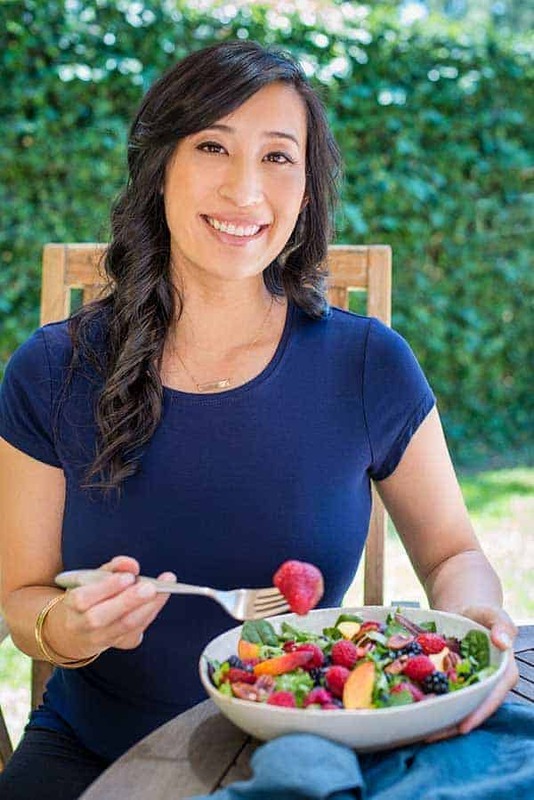 I’m not clear on the char sui though……do you make the seasoned char sui recipe that I found also on your site and then use it as the base for this recipe and then add the additional seasonings listed on this recipe? Seems like a lot of different seasonings but I’ll try it if that’s the way it goes. Thanks! HI Ellen! Yes, if you want to make homemade char siu please follow my recipe in the link. I made the directions hopefully more clear in the char siu bao recipe for the seasonings, and when to add them. Many of the seasoning ingredients are used again and are similar. When I have limited time, I also buy some char siu from local chinese restaruants, but it’s fun to make it at home too! Thank you for your comments! Hi again I made the bao and the recipe was right on! In fact we’ve gone through two batches now and have people lined up to visit to try them next time we cook. 🙂 Many thanks! Thanks Jess. Your recipe and video were very helpful for my first attempt at steamed pork buns. I halved the recipe and they turned out better than i expected and certainly satisfied my craving. Unfortunately i don’t have any left over! Hi Vanessa! Reducing the recipe to 1/4 of the batch size will not provide as accurate of measurements, however if you would like to use only 1 cup of flour, then I reccomend the following (however you will have to approximate by sight): 1 cup flour, 1/2 teaspoon of yeast, 3/4 teaspoon of baking powder mixed with 1 teaspooon of water. Please let me know if you have any questions! I will be trying to cook your chasiubao today for snacks and dinner extras.I mixed all the ingredients,but forgot to mix the yeast with water and sugar first…..but the texture of the dough feels okay so far…….I will try it again tomorrow and remember to mix the yeast with warm water and sugar thoroughly.The photographs of all your foods look so delicious and I can smell the aroma. I have been searching for the perfect steamed bun dough for more than 7 years now. I can’t believe how easy and lovely your recipe is!!!!! My friends and family thank you! Yay Jacquie! It makes me happy hearing that you enjoy the recipe! Hi! Do you mix 1 1/2 tablespoons or teaspoons water with the baking powder? I am looking forward to trying this recipe with my family.